When we tell people we live in Bordeaux, the response is “Great wine, but what city do you live in?” Bordeaux is indeed one of the most famous wine regions in the world, but it’s also a city. A gorgeous honey-colored neoclassical city married with the remains of a medieval town…but that’s a story for another day. Bordeaux is a city that rightfully and proudly wears the title of Wine Capital of the World. It’s an indisputable title that is clear from the moment you’re greeted by the biggest wine bottles you’ve ever seen as you await your luggage arrival on the luggage carousel at Bordeaux-Merignac Airport. The airport even has its very own vineyard as you step outside its’ door. 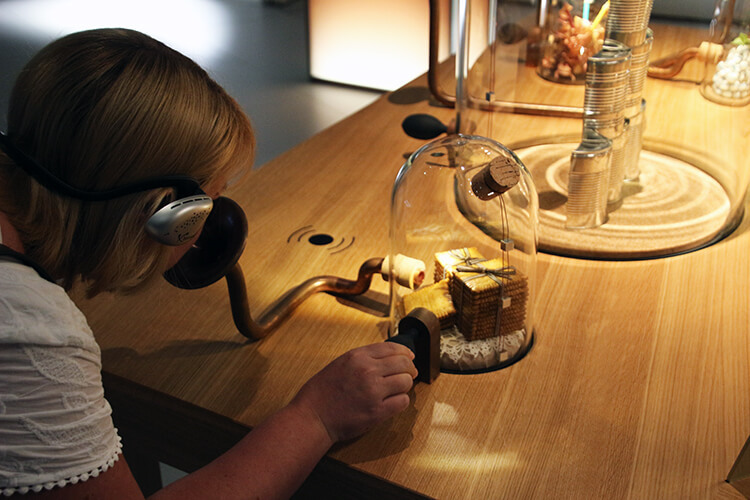 It’s no wonder that La Cité du Vin, the world’s first interactive wine museum, would want to call Bordeaux home. As wine travel writers, we’ve been to our fair share of wine museums. And I hate to say it, but they’re usually dreadfully boring. All of them seem to have an ancient wooden press, rusting equipment and little placards filled with technical terms. Once you’ve seen how the Romans made wine once, you get it. La Cité du Vin is something entirely different though. 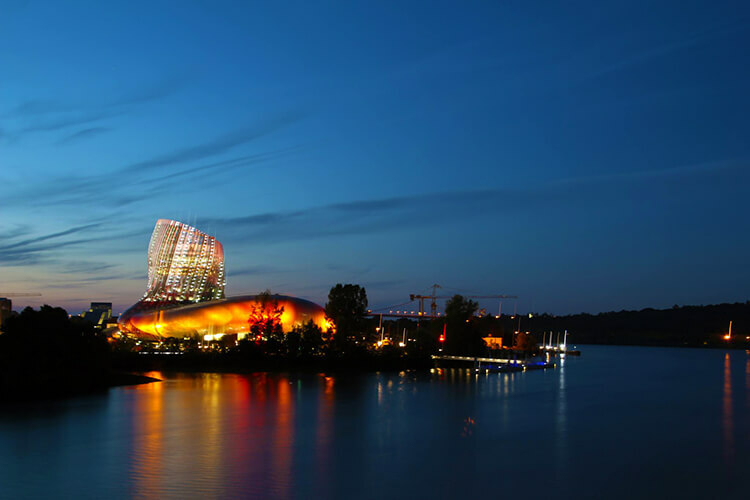 As it prepared to open in June 2016, the big media sites touted La Cité du Vin as France’s “wine theme park”. We don’t know that we’d go as far as to call it a theme park, though. To us, theme park implies rides and general over-the-top-ness. But it is an impressive, interactive experience designed to engage all wine lovers both through the permanent exhibition and a calendar full of wine courses and wine themed events. It’s also clear why National Geographic named La Cité du Vin as one of the best museums in the world. As La Cité du Vin says, it doesn’t matter if you’ve completed your WSET certification or just enjoy sipping a glass on a terrace. No matter what your level of wine knowledge, you’re immediately lured in with a stunning video of the world’s most beautiful wine regions. Of course, the rolling hills of Saint-Emilion’s vineyards with its charming chateaux is included. Our new home. 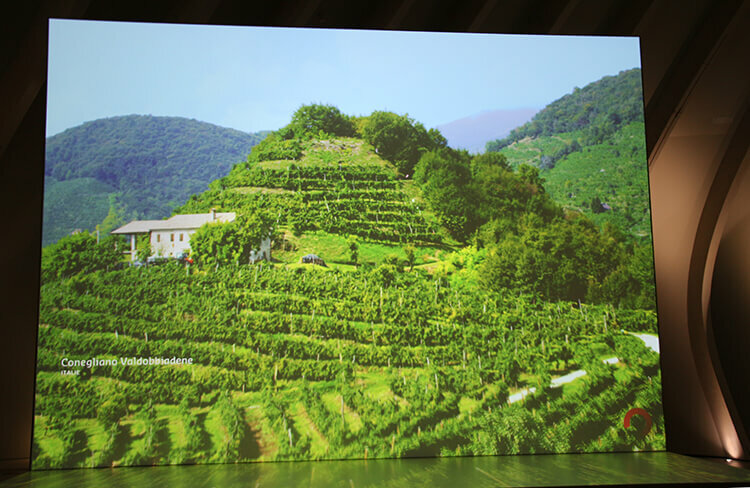 And then, our old home: the terraced vineyards of the Prosecco Hills of Conegliano. 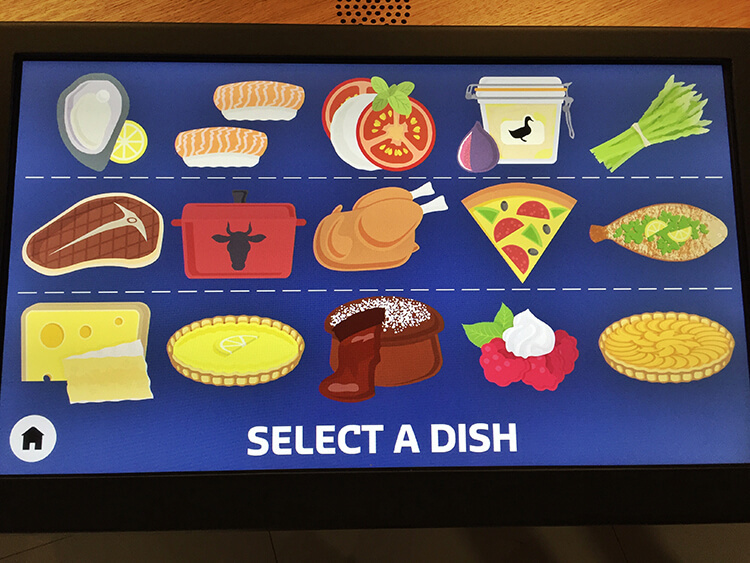 You just point your audio guide, which comes in a variety of languages, to an exhibit to activate it. There’s a 3D vineyard where various winemakers from around the world tell you about their region and winery. There globes you can spin and pinpoint any wine region in the world to learn more about it. But our favorite room is the wine tasting room. Here, the sensory experience of wine is explained through four of the five senses. All that’s missing is the glass of wine to complete the experience, but that comes later. The tasting room is divided up by red and white wines and all their aromas. Adults are encouraged to play, to sniff. A fun animation teaches wine and food pairing techniques. The right food can really bring out a wine’s notes. And the wrong food can make a wine taste terrible. 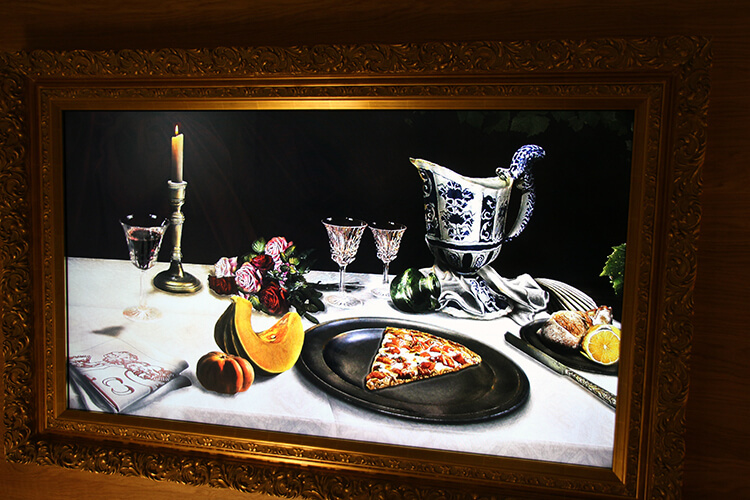 There’s movies, actual dining room tables where you can sit down and feel like part of the conversation and animations visualizing wine in art. 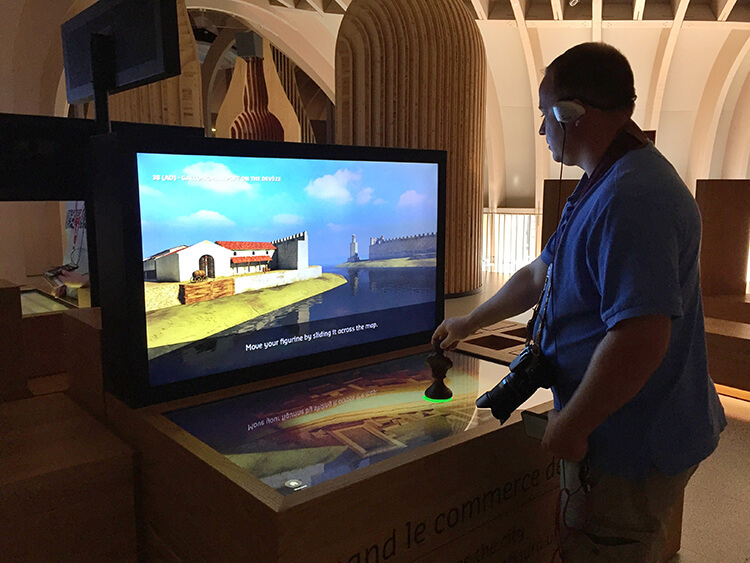 La Cité du Vin would be amiss if a little history of how Bordeaux came to be the Wine Capital of the World weren’t included and another interactive game lets you step back in time and in to the streets of this port city. After the immersive visit through the exhibitions, take your ticket and head up to the eighth floor. The top floor enjoys a 360° panoramic view over Bordeaux and has a tasting bar. Your ticket entitles you to choose from about a dozen different wines from around the world including various Bordeaux and even wines from China or Georgia (the country). 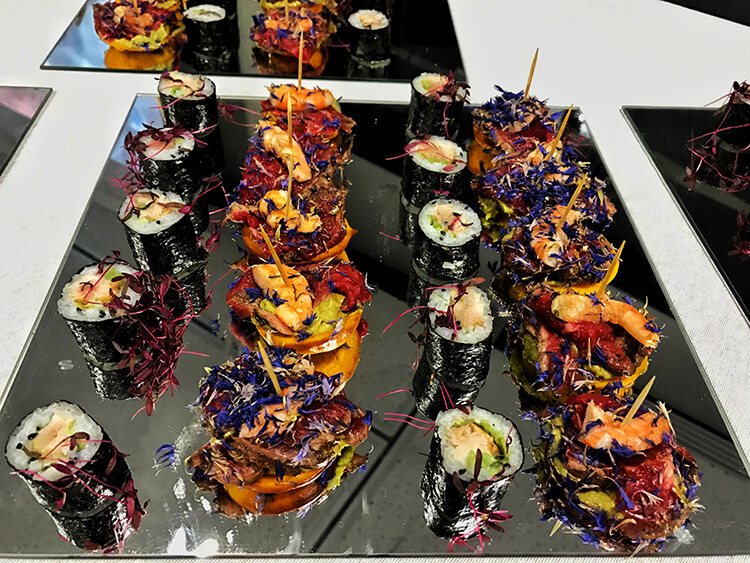 Though you’ve already taken in the view from the eighth floor tasting bar, head down just one floor to the gourmet Le 7 Restaurant. We recommend booking a table about an hour before sunset because Bordeaux has some really spectacular sunsets with the sky turning shades of gold, pink and purple. You can expect a gourmet experience with executive chef Bruno Grand-Clément, who gained his experience at the Jules Verne restaurant at the Eiffel Tower and under Michelin chef Alain Duccase, at the helm. 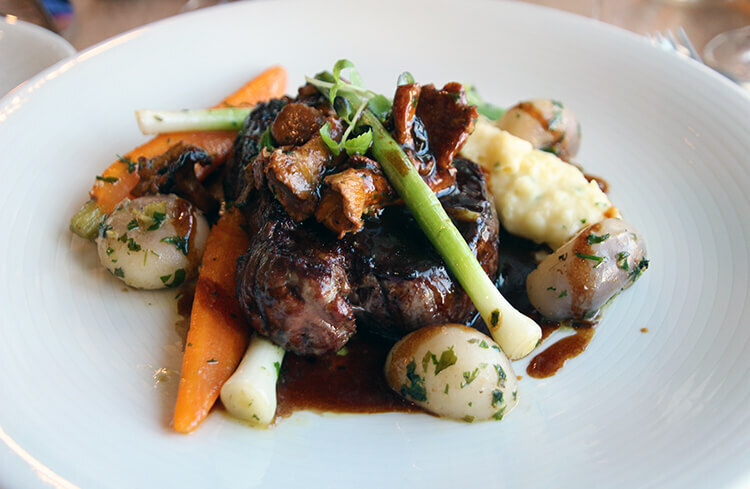 The menu features seasonal Bordelaise classics and the freshest fish from the Atlantic Ocean, which is just over 30 miles from Bordeaux. 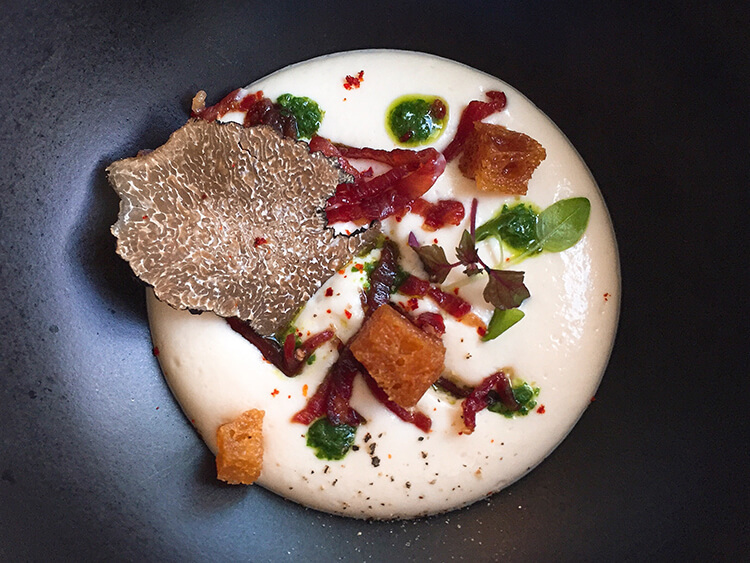 The chef sent an amuse bouche of a creamy cheese mousse topped with a summer truffle, croutons and oh-so-deliciously salty Jamon Iberico from Spain. If the amuse bouche was any indication, we were definitely in for a treat. 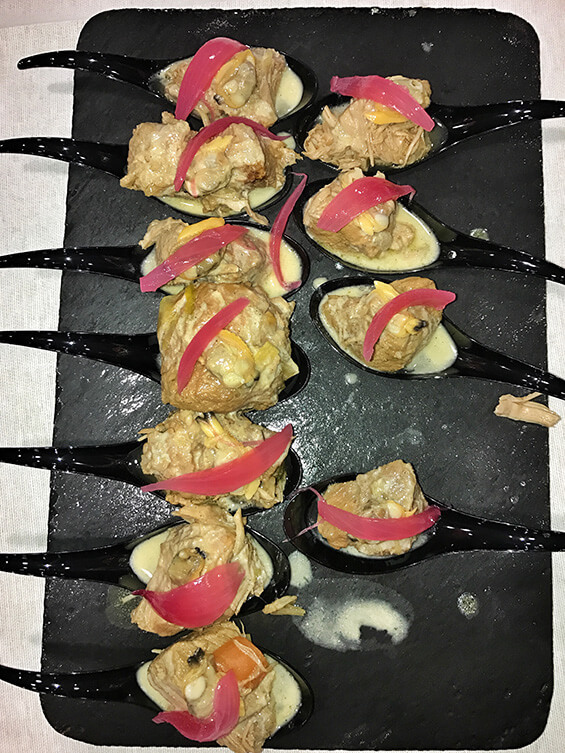 The Aquitaine, the region (sort of like states in the US), is the region where Bordeaux is located and also the top foie gras producing region in France. Naturally, we started with the foie gras with red berries. I have yet to have a bad foie gras in Bordeaux and this one was smooth and creamy, complimented nicely with the not-too-sweet nor not-too-tart red berries. Neither of us had ever had green tomatoes before, but the heimloom green tomato salad with burrata cheese was delicious. The tomatoes were the sweetest variety I’ve ever had and now I’m dying to find some at the market to recreate this salad at home. The filet of beef followed as our main course. I do have to note that I had to send my filet back. The French do not eat beef well done, which is fine by me since I enjoy my steak medium-rare. My dining companion, however, insisted on a well done filet and both arrived that way. The issue was quickly rectified and my filet was delicious once properly cooked. As usual by this point in the meal, we were already feeling full. But who can’t find room for dessert? 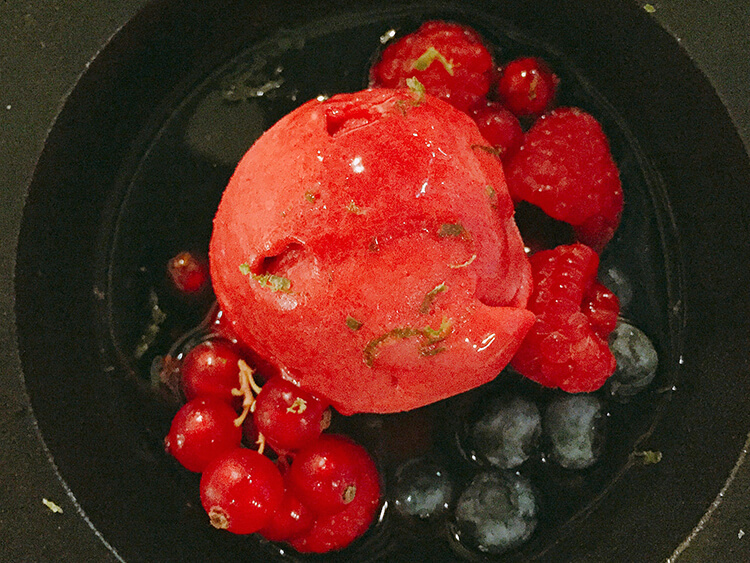 We shared a red berry sorbet in a soup of red berries and wine. It was light and the perfect sweet finish to a delicious meal. 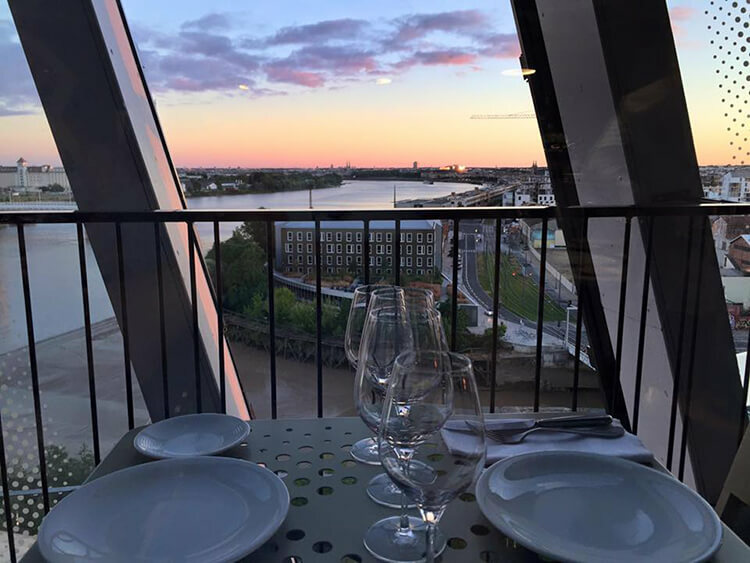 Dinner and a movie is a date night classic, but La Cité du Vin takes it to the next level with their Ciné Gourmand series. 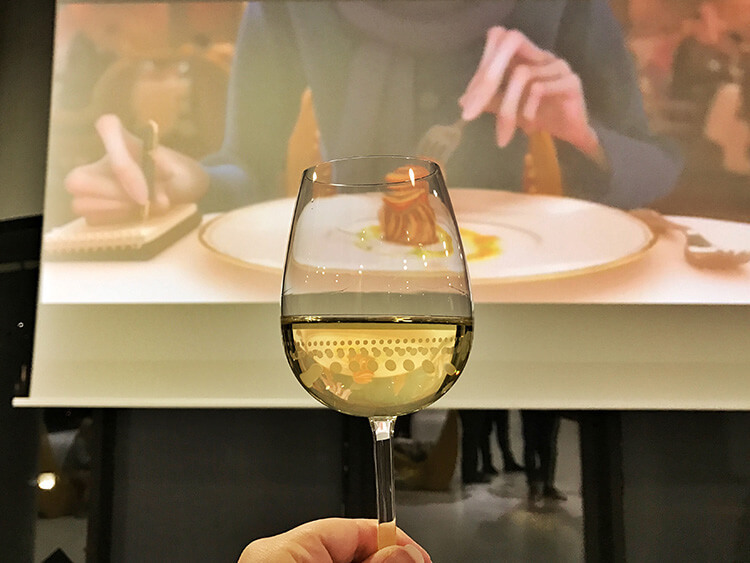 We were invited to attend the new event series at Bordeaux’s (what I like to call) wine experience center, for a night with one of my favorite Disney movies: Ratatouille. I wasn’t entirely sure what to expect, but I knew that we’d be watching the movie Ratatouille and having a Ratatouille inspired dinner with wine tastings from various Bordeaux appellations. In winter, La Cité du Vin closes at 6pm so it all felt very exclusive as I arrived with a trickle of other guests that were also attending at evening Ciné Gourmand event. Perhaps because it’s a new event, but my guesstimate is that there were around 50 of us total in attendance, including a handful of children. It was the perfect sized crowd, in my opinion. The movie, which was in French (I wasn’t sure if it would be in French or English prior), was shown in the auditorium first. 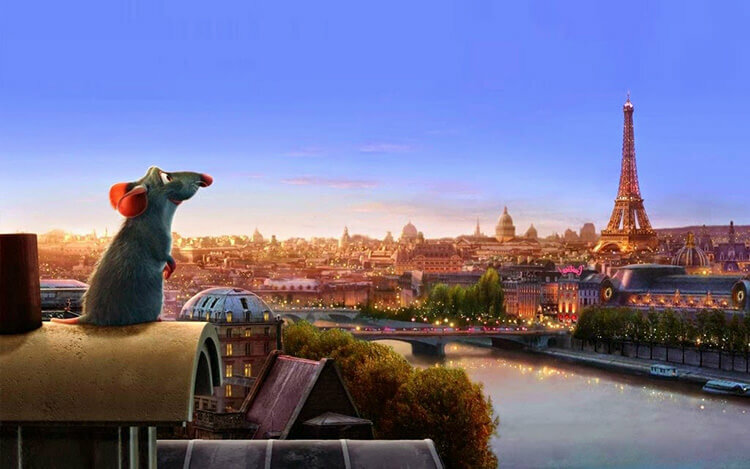 Since I know the Ratatouille story line fairly well, I could easily follow along with what was happening even though my French is still pretty terrible. I have to say that I felt French camaraderie as I laughed along with my fellow attendees, presumably mostly Bordelaise or long-time expats. As a side note, watching movies and tv shows you know pretty well in another language is actually a really great way to get exposure to it and learn. Of course, if I’d attended a film I wasn’t familiar with and had not seen before, I probably would have been a bit lost. It’s just something to keep in mind if you’re a non-French speaker visiting Bordeaux and thinking of attending Ciné Gourmand. As we all exited the auditorium, the first course of dinner was already waiting. The food was all finger foods, though there was plenty and we were stuffed by the time we’d tried everything (and went back for seconds). It was actually quite clever because, as I’ve come to learn about the French, everyone was mingling and we even met a few new people. The very first thing I noticed were the mushrooms, which looked exactly like the cartoon mushroom Remy roasted on the tv antenna when he got struck by lightning. 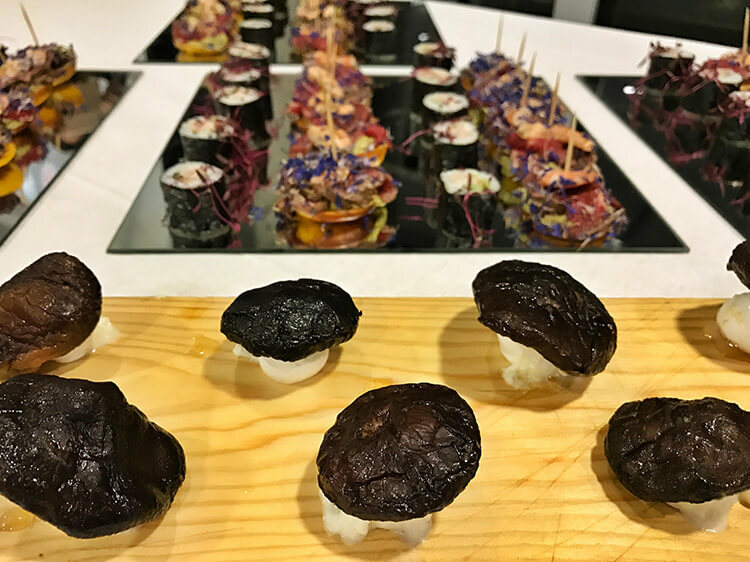 I don’t know what “lightning-y” tastes like, but Chef Emmanuel Perrodin’s mushrooms with parmesan and meringue were delicious. I won’t admit to how many of those I ate, but it was definitely more than one. 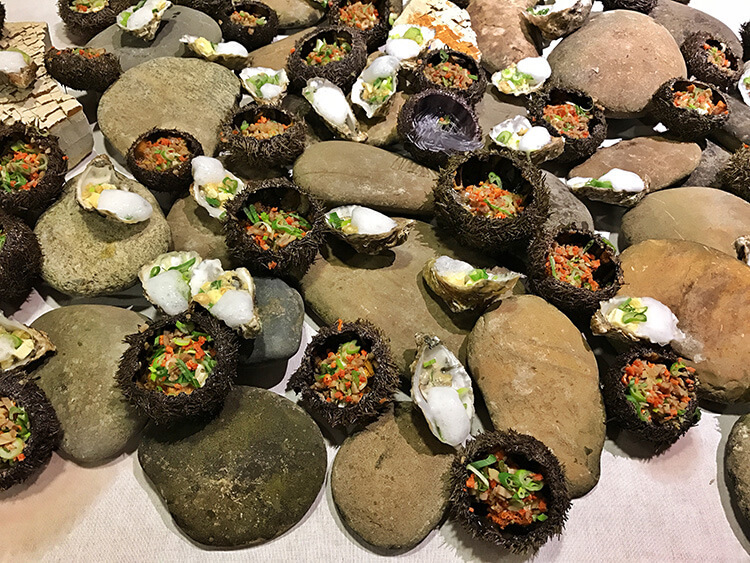 There were also sea urchins cleverly served in their shell with bacon and chestnut, Arcachon oysters with camembert, sushi with a smoked bonito fish and a sweet potato pancake topped with beef and shrimp. Every bite was incredible. Of course, Remy’s soup was what put Gusteau’s back on the map as food critics gushed about it. No surprise, then, that at a Ratatouille inspired dinner a “spicy, yet subtle” soup would appear. 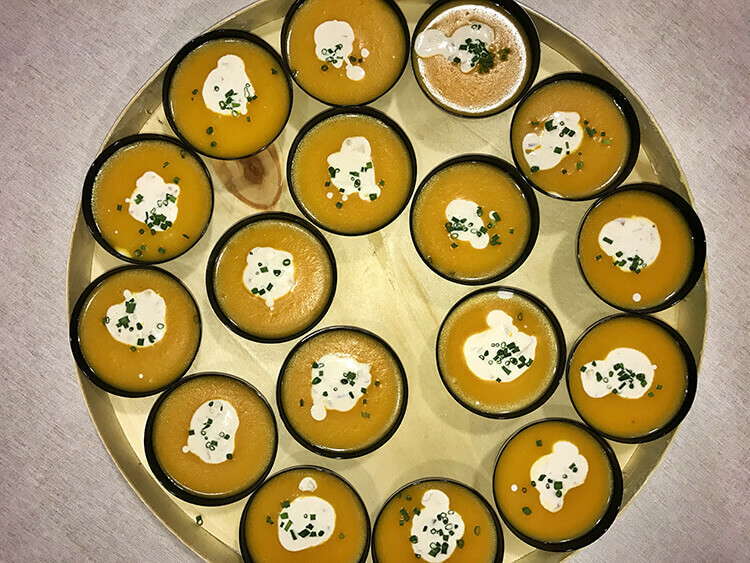 Chef Perrodin’s was actually a creamy squash soup dressed with the oh-so-delicious French cream. And as in the movie, we all raved about the soup. 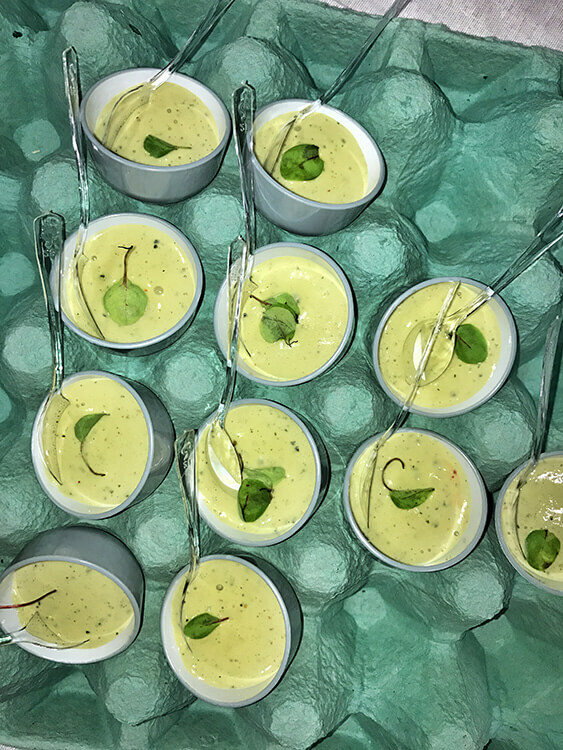 A creamy egg with basil that was light-as-air was served in little cups to look like egg shells and the individual cups were all in egg crates. The presentation of each dish was truly beautiful and we were all like paparazzi snapping photos as each new dish appeared. The veal with vanilla was a delicious marriage. I wanted an entire plate of that alone. Chocolates with grapefruit and a chocolate cookie bar. The salted caramel butter creme puffs went so quickly I never got a photo. 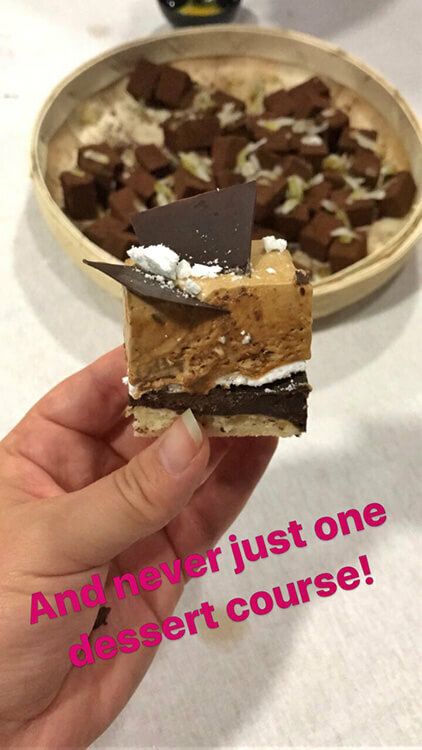 But I needed to save room, because in France there is never just one dessert course. No, this Ratatouille inspired dinner had three! First chocolates with grapefruit and dusted in cocoa powder appeared, followed by a pear and dijon chutney. But it was the little pastries like Remy-sized cream puffs filled with the most delicious salted caramel butter cream that stole the dessert show for me. Stuffed as I was, I had to have two.aAll this food was paired with four wines from Bordeaux: a white from Chateau Le Camplat from Blaye Côtes de Bordeaux, Chateau La Fleur Peyrabon 2009 and 2010 from Paulliac and Chateau Tour de Yon 2012 Grand Cru from Saint-Émilion. All this food was paired with four wines from Bordeaux: a white from Chateau Le Camplat from Blaye Côtes de Bordeaux, Chateau La Fleur Peyrabon 2009 and 2010 from Paulliac and Chateau Tour de Yon 2012 Grand Cru from Saint-Émilion. As we ate, drank and mingled a band played and scenes from Ratatouille and Burnt played on the screens in the reception hall. Ciné Gourmand was a really fun event that we’re definitely looking forward to attending again. It happens on the first Wednesday of every month, so check La Cite du Vin’s event calendar to see if one of your favorite movies is showing when you visit Bordeaux! La Cité du Vin is easily reached on public transportation from anywhere in Bordeaux. Take the tram Line B to the stop La Cité du Vin. Download the TBM app for tram and bus time tables. Le 7 Restaurant is open daily from 9:30am – 11pm and serves breakfast, lunch and dinner. Reservations strongly recommended. Easily book your reservation online on LaFourchette. 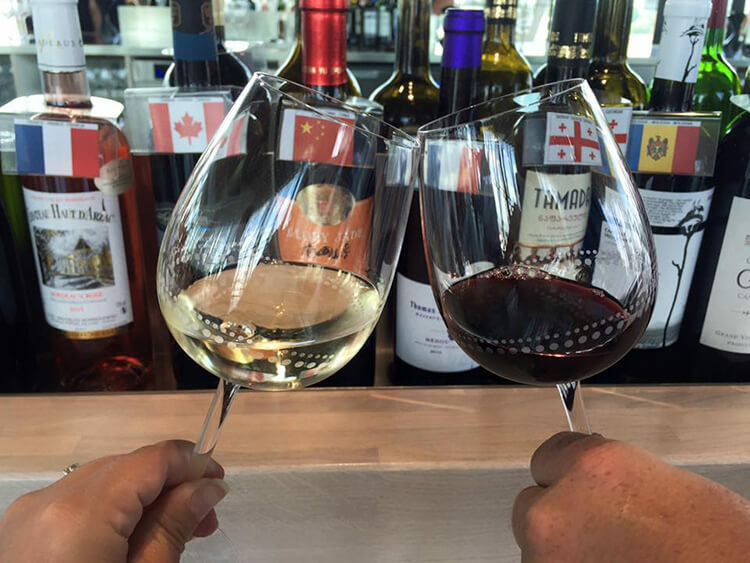 La Cité du Vin is open daily from 9:30am – 7:30pm. Tickets are available onsite, but avoid waiting in line by booking tickets online. Adult are €20. 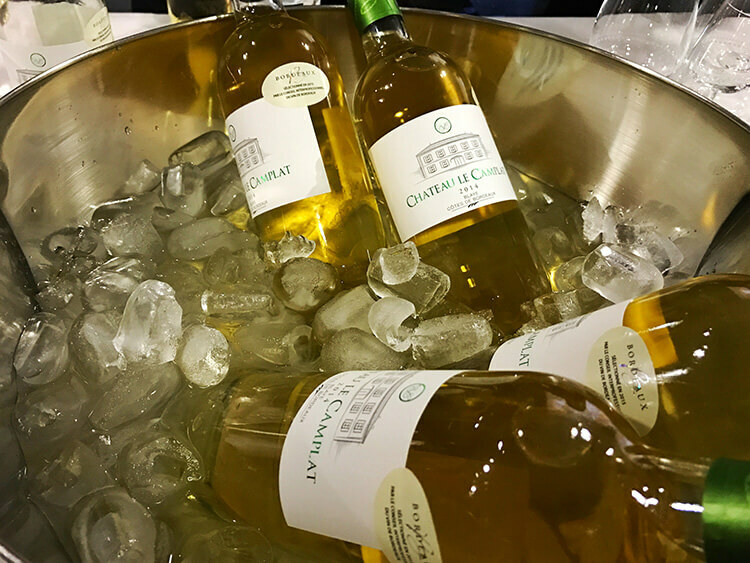 La Cité du Vin’s Ciné Gourmand is on the first Wednesday of each month. Check their event calendar for upcoming events and to book. Our visit was provided by La Cité du Vin and our meal was provided by Le 7 Restaurant in order to bring you this story. However, Luxe Adventure Traveler maintains full editorial control of the content published on this site. As always, all thoughts, opinions, and enthusiasm for travel are entirely our own. This article contains affiliate links. When you book on Viator or LaFourchette or shop on Amazon through our affiliate sites, we earn a small commission at no additional cost to you. Bordeaux looks like such a great city, especially if you’re into food and wine! That looks delicious. Bordeaux is definitely a great city to visit if you’re in to food and wine! This is the Wine Capital of the World and there are a lot of top notch chefs creating really exciting cuisine here. Stay tuned Alberto, because we’re going to have a lot of tips for our new home. Glad you enjoyed Le 7 Restaurant! How flipping cool is this?? I have never seen a wine museum like this before! 🙂 And it has it’s own restaurant too? If I ever make my way to Bordeaux, I am definitely checking this out. The museum is definitely unique and a must do when visiting Bordeaux! Hope you get to check it out soon, Carrie. GAH!! I am so jonesing to visit the wine museum. I have heard so many wonderful things about it!! Gorgeous photos! Come visit Bordeaux, Lauren! There’s a lot of exciting things happening here. And the food is to die for. At least you got to enjoy some wine after all that sensory exposure. The food at Le 7 looks amazing, especially the tomato and buratta salad. The museum looks amazing! I must go there. Sumptuous dishes and dessert, and those wines are amazing, I would love to go and live in Bordeaux. 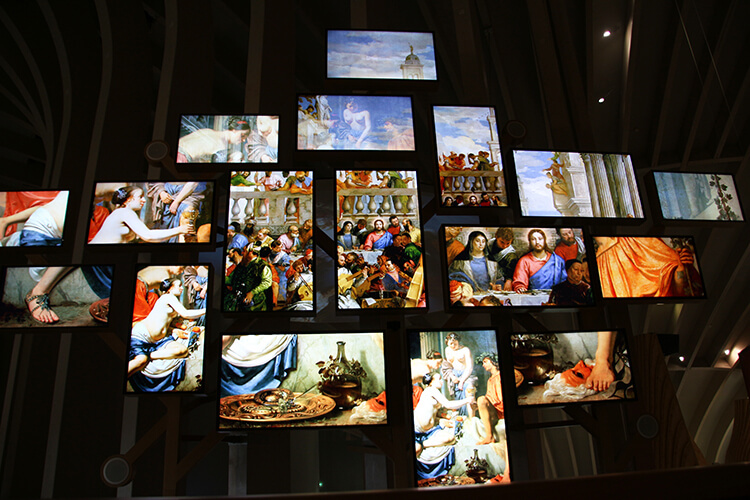 The museum looks cool and modern as well, will the flat screens and interactive attractions. The food is really terrific at Le 7 Restaurant! Love the idea of this wine museum. It is always fun visiting vineyards and this museum sounds like a step above. Agree, my favorite part would also be the wine tasting section of the museum 🙂 The food looks delicious…beautiful as well. What a great place to call “home”..lucky you! I’m not usually in to museums, but this one is great because it is so interactive! I want to go back and take some of the classes and workshops that they offer. Never have been to a wine museum but it does look amazing, I love visiting museums! The food looks delicious in particular the beef and the heirloom tomatoes! Enjoyed the write up. The heirloom tomatoes were so good! I’ve never had a sweet green tomato like that and I’ve been searching all over to Bordeaux to find them to replicate this salad at home. That looks like an impressive building and I love the interactiveness of the museum. Looks like I’d learn a lot. Love the tip for booking before sunset too. Well worth the visit. 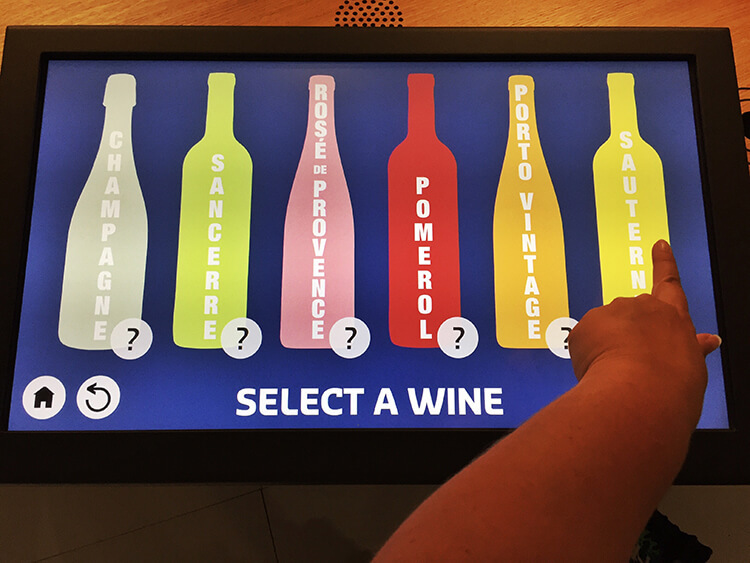 The great thing at La Cite du Vin is that there is something for any level of wine knowledge. Oh, what an interesting, interactive museum. And loved the view from the top. The view is pretty spectacular! I love picking out my neighborhood from up top. I need to definitely schedule my next trip to Bordeaux around this event. It looks like so much fun. Oh, and with Ratatouille playing! I’m jealous. I’m with you on this one! Sounds like a plan! Now you know when to visit! I was very impressed with the food the chef created that was inspired by the movie. Can’t wait to see what they come up with for the next Ciné Gourmand! What an amazing idea the movie and the movie themed dinner after. I would definitely want to visit although I don’t speak french, but as you suggested I will pick a movie I have already seen! It really wasn’t a problem since I knew the story of the movie already, but I am learning to speak French. Certainly attending a movie in French isn’t for everyone, but when in France! Here in Lisbon, Portugal, there is also cinema and dinner. But this one it seems better 😉 Cinema maybe not, but food for sure! I’ve been to some other cinema supper clubs and this was definitely the tastiest one! I just told my husband about this. He is a lover of wine and the Cite du Vin will be the kind of place for him! We will go!!! Glad to hear you’re planning a visit, Carol! Fine food, French wine and a French movie sounds like a sophisticated way to spend an evening. Cite du Vin sounds like a great spot for a treat. What a fun way to experience a movie. What’s not to love about all of that food and wine, from sea urchins to chocolates with grapefruit? Looks like you had it all! There was quite the variety of dishes and plenty of food, so if you didn’t like something you just had to wait for the next round to arrive. Even the children in attendance loved it. This sounds absolutely incredible! I’ve seen Ratatouille more times than I can count due to my niece and nephew’s obsession with the flick. I luckily would’ve been able to follow along as well, even though my 2 years of French class in high school faded away a long time ago. I LOVE that they served ‘lightningy’ mushrooms and I would’ve been all over those cream puffs filled w/ salted caramel butter cream. Seriously, sounds like the perfect way to spend an evening and will definitely keep this in mind when I get back to France for another visit! The lightningy mushrooms were so good! I couldn’t stop eating them. It was really cute the way it was all presented and made for a seriously fun night. As if la Cite de Vin didn’t sound amazing enough the Cine Gourmand looks like such a fun event! Can you recommend a good hotel in Bourdeaux? Ratatouille is a great movie. The food in the pictures looks so damn delicious I wouldn’t care if a rat actually made it. Such a great idea. Oh my! Great post. What a wonderful event! I’m a huge foodie film fan so I’m adding this experience to my foodie bucket list! Ratatouille is my favorite. There’s no way I could limit to only one of those Lighting-y mushrooms and all the desserts. I just attended a Ratatouille inspired dinner by Disney that was out of this world!